Since it's such a big event, AIO's oversized birthday card is on display at the Focus on the Family bookstore in Colorado Springs for fans to sign. Who knew Adventures in Odyssey would get this big?! As the Adventures in Odyssey team gears up for an exciting week of preparations, meeting up with actors and production team in Dallas, Texas, the fans are getting just as excited as they are about the whole once-in-a-lifetime event. 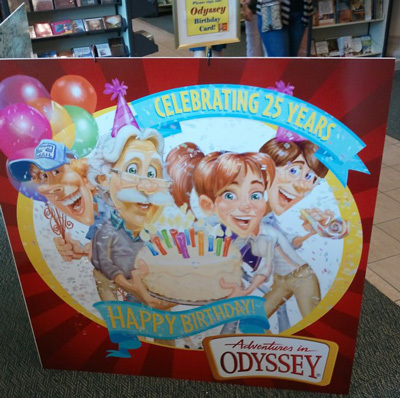 Five years ago, the Odyssey team celebrated its 20th anniversary with much fanfare, podcast crossovers, and the release of Adventures in Odyssey: The Official Guide (and Album 50, of course!). With the 25th anniversary quickly upon us, fans attending the live show at Irving Bible Church in Dallas on Saturday, June 16th (that’s this weekend!) can expect an exciting time of witnessing a live performance of an AIO show, a time to meet actors and obtain autographs, and more surprises. If you follow The Odyssey Scoop closely, then you know we’ll be on top of events as they take place. Of course, you can also follow us on Facebook (we like our Facebook BFF’s) and stay informed on news that way. Our podcast hosts Kevin McCreary and Garrett Vandenberg will be chronicling their adventures at this event and we’ll be sure and release it via video podcast soon. It’s hard to believe we’ve been providing the Scoop on Adventures in Odyssey since right around their 13th anniversary. Oh, how time flies! Will you be attending the live show this weekend? Be sure to share in the comments below.